Fenetex is a leading provider of hurricane retractable screens. These screens offer the same protection as aluminum shutters in style. They don’t block the light like aluminum shutters do so you can still enjoy natural sunlight. 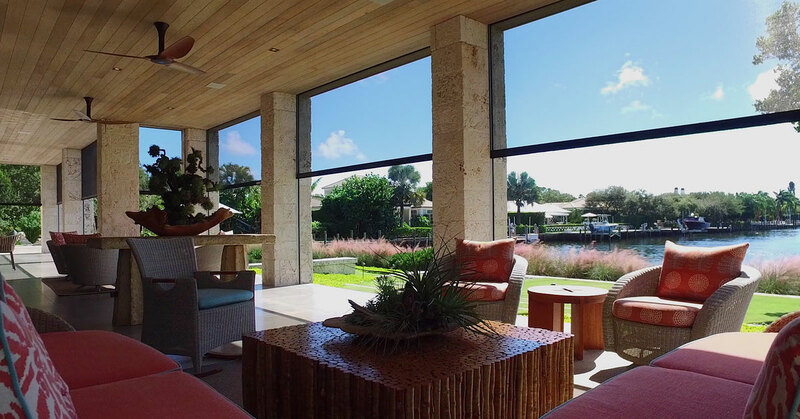 Rather than stick out, these screens blend seamlessly into your patio or lanai but are ready to deploy in a snap. Through years of innovation, Fenetex has been able to make products that look attractive and stand up to severe weather. Strong, reliable, and well designed, Fenetex screens are an often-recommended product to our customers. They also construct dual screens, which can offer you two options like insect and hurricane protection. Fenetex screens are made of aramid and polyester fibers, which are some of the strongest materials available. The screens also have a special PVC coating that allow the screens to block harmful UV rays. The hurricane screens from Fenetex are also certified by the Miami-Dade and State of Florida regulations for High Velocity Hurricane Zones. As a Fenetex dealer, we can offer you these high-quality, highly innovative screens. When you choose Armored Dade to install your new hurricane screens, you’ll always receive a proper job done right the first time. We can also help you choose from the many customizable options for Fenetex screens. Contact us today to learn more about these products.